You can lose weight and still have fun. If you're craving a toned body, you don't have to endure the misery of the treadmill to get it. You can skate your way to physical fitness through rollerblading. Skating gets your entire body in on the fitness action, burning many more calories than you'd burn by lifting weights or doing endless crunches. The number of calories you'll burn while rollerblading depend on a couple of different factors. Rollerblading is a form of cardiovascular exercise, which means it works both your heart and lungs, improving circulation, reducing your risk of heart problems and potentially lowering your blood pressure. Even better for the fitness-conscious, it can help you lose weight. Your legs and arms will get a workout, and you can customize your rollerblading routine by adding weights or rollerblading with your dog to make your routine more challenging. Your body size is probably the biggest factor affecting the number of calories you burn. Larger people burn more calories, and if you have a lot of muscle, you'll burn even more calories. Harvard Health Publications reports that, on average, a 125-pound person will burn about 210 calories rollerblading for 30 minutes, while a 185-pound person will burn 311 calories. The intensity of your rollerblading routine is a major factor in how many calories you burn. 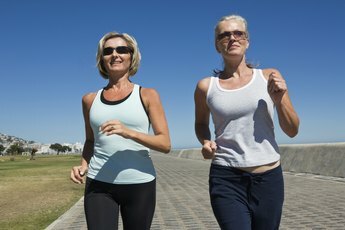 If you're winded and have trouble carrying on a conversation, your workout is high-intensity, but if you can easily talk and are skating at a leisurely pace, you're doing a lower-intensity workout. Rollerblading at a faster pace or uphill will generally burn more calories. If you want to rev up the intensity of your workout, try interval training. Interval training can increase your metabolism and help you build muscle. Rollerblade at a leisurely pace for one to two minutes, then speed up for a minute or two. Continue altering your pace as you rollerblade. Interval training is particularly effective if you can't manage a high-intensity workout for the entire time you're rollerblading because it allows you to boost your intensity for brief periods. Is Roller-Skating Better Exercise Than Walking?